In the last couple weeks, the Spring migration has really started to kick. Many colorful visitors have stopped by our yard in the last two weeks. Some of my favorites have been: Black-throated Green Warblers, Ruby-crowned Kinglets, Chestnut-sided Warblers, Blue-headed Vireos, and Red-breasted Nuthatches. Gotta love those names. 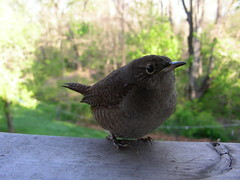 One morning this week I woke up to the bubbling call of a House Wren - first of the season. They breed every year in our yard without fail, usually building their stick nests in one of the nest boxes on our property. Later that morning I snapped a great picture of the little guy. You might be wondering how I got so close. Unfortunately he had flown right into one of the glass doors on our house, and was in a state of shock when I took the picture. Even though we have most of the windows in our house covered with ultraviolet decals we still have occasional collisions. Usually a small bird can shake things off. They go through a slow "reboot" cycle where they seem to check out all the vitals, and only after all tests pass do they take off. Eventually this guy decided all systems were "go", and he turned and went. I highly recommend reading Cornell's article on window collisions. Here at our house we have found that the ultraviolet stickers from WindowAlert work very well. Definitely check them out. Since we put them up the rate of collisions has gone way down. I have had a chance to use Oracle SQL Developer rather heavily in the last two weeks, on Windows, OS X, and Linux running under Java 5. All in all I am still very positive about it. It is definitely usable for "professional" work, and I keep discovering more "nice to haves" in the UI that make it a very workable tool for most SQL slingers. It is clear that Oracle really put a lot of effort into building this tool. Sounds like a lot of complaints, but all-in-all I love the tool and will definitely keep using it heavily. Some of my coworkers find my blog to be a little, um, "disjointed" - first a post about spiders, then one about the Linux kernel, "nanoseconds", and Java 5, and so on... Last time I talked to Portico's COO, he said he had looked at my blog and it gave him a headache! :-) I think he expected to see some stuff about technology, but was suddenly and unexpectedly exposed to videos of flocking birds. What can I say? I get bored of computers from time to time! Wait a minute. That's totally false. Actually, the deal is... I have interests other than computers! Sacré Bleu! And, pray tell, what is this OTHER blog built on? Why Roller, of course! 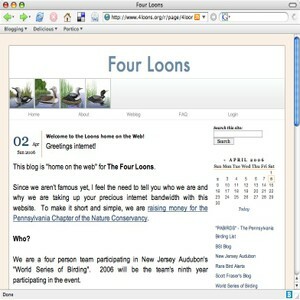 So here's the deal - I needed to set up a blog server. I wanted it to be Java based. I didn't want to use a commercial service. And it needed to be easy to use for non-techies, because I was going to be sharing the server with such types. I did a lot of research, and finally settled on Roller. My first experience was via installation on my OS X desktop at home. I chose MySQL as the backend. Could of used just about anything else, but they point out in the Roller documentation that MySQL is the preferred. We have used MySQL at Portico Systems for many years now - in fact our first major online presence for an HMO was built on a "LAMP" stack, but back in 1997/1998. We also use MySQL as the backend for many of our internal systems, including tracking the millions of version control checkins that have been made over the years to our CVS servers (using ViewCVS). For the app server I used Apache Tomcat 5.5.16 (running under Java 1.4.2_09). It is an amazing thing when you can migrate an application like Roller, that is a mix of native (MySQL), and "managed" (Java) code, from OS X to Linux with no problems whatsoever. So that about brings it all home - biology and software - worlds collide! That's just how I roll people. Goodbye for now.